Sedan, Kansas - Yellow Brick Road and That's My Brick!® have joined forces to raise money for community projects through Sedan Area Economic Development Committee (SAEDC). 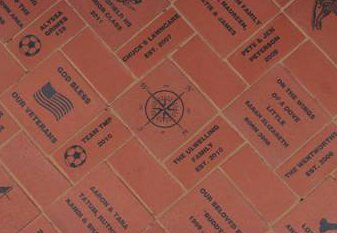 You can help our community by purchasing a brick and we will add your personalized brick to the longest yellow brick road in the world! This site automatically keeps track of our orders. The "Yellow Brick Road" idea evolved from a committee formed to Save Our Sedan (SOS) in conjunction with the city council, merchants and the general public. The first section of bricks was poured in main street sidewalks in December of 1988. The "Yellow Brick Road" circles the entire downtown area with over 11,500 bricks sold, representing every state in the U.S. and 28 foreign countries. A special recognition brick has been given to our sister city of Sedan, France. Names in our "Yellow Brick Road" include individuals, businesses, schools, and organizations with a special section for veterans and celebrities. Enjoy the celebrity section of stars such as Bob Hope, Elizabeth Taylor, Whoopi Goldberg, Brooke Shields and many others. We also received the Good Housekeeping Seal of Approval. Sedan,a small rural town is located on US166 and K99 highways in scenic southeast Kansas, and is a good place for a business, to live and raise a family. While conveniently located within two hours of Wichita, Tulsa, OK and Joplin, MO Sedan offers quaint shops, cafes, unique seasonal attractions, hunting, fishing and golf... Join the fun and put your brick on the Yellow Brick Road.